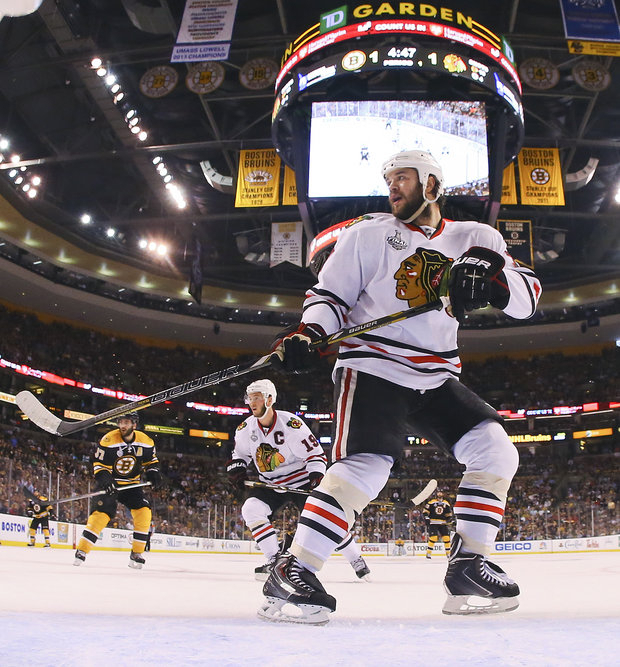 Blackhawks and bruins knotted at 2 , thanks to Brent Seabrook. Despite the warming temperatures, the rush of cold air and glistening ice is still the center of attention for Chicago and Boston fans. What a blast the NHL Stanley Cup Finals is right now. And of course, it was the blast off the stick of Brent Seabrook that propelled the Blackhawks to a 6-5 overtime win. With the series tied at two games each, the Blackhawks have the momentum. If this isn’t entertaining then get your pulse checked. Wednesday’s game had two goal leads by the Hawks only to be vanquished by the Bruins. Goalies who have been at the top of their game both had a hard time. Stars that needed to shine did just that and so did some players with lesser accomplishments. Both team’s defense had lapses, but for some reason the non-hockey purists don’t care (lighting the lamp is more entertaining). Boston and Chicago both love their sports teams. Fans on the East Coast were gracious to Midwesterners who graced their city for the two Stanley Cup games this week. Whenever I travel to an event I spend time talking to the locals. This was one of many visits to Boston. My response is always favorable to that city and its narrow streets, rich with history, interesting people and great food. Boston has had a sad, yet, resilient feel to it since that day in April when two bombs tore through the Boston Marathon. It doesn&apos;t feel like a city of victims, but strong-willed survivors. There are banners and T-shirts that emphasis their saying, “Boston Strong”. When you walk down Boylston Street where the two explosions happened, there are few reminders or remnants at those two sites. Instead the memorial was moved down the street to Copley Square, where hundreds of running shoes, notes, and pictures are neatly displayed to honor the ones that died or were injured. It also felt like it was honoring that city and everyone that it touched that day. You can only hope that they will heal someday. Back here in Chicago, the Blackhawks and Bruins will play Game 5 Saturday night. In the morning, there will be another Boston-Chicago sporting event on a smaller scale. The Inaugural Summer City Classic will be played at Les Miller Field, at University of Illinois-Chicago Baseball Park. Chicago’s Jackie Robinson West Little League team will take on the Boston Astros. It is an effort to bring urban youth together on the baseball field in a friendly competition and spotlight the need to help these kids look for a positive direction. It will be presented by the “Foundation to be Named Later,” and sponsored by Cubs President Theo Epstein and his twin brother, Paul, a social worker. The Epstein brothers and two advocates for urban youth, Robert Lewis Jr. and Eric Davis are trying to make a difference in the community. Theo and Paul will be the “acting” managers, and Cubs broadcaster Len Kasper and Hall of Famer Peter Gammons will “call the game”. The game is free and starts at 9:30 am. Chicago and Boston bonding with sports is a good thing on any level.